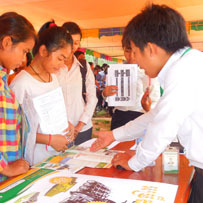 This week, PEPY’s Dream Class hosted the second annual Skills Fair at Kralanh High School. After the success of last year’s event, we were happy to see another crowd of students eager to discover opportunities for life beyond school. 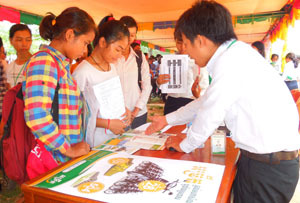 The objective of the event was to increase awareness of opportunities after high school among students. What kind of major should they pursue to fit with current and future job markets, and connecting them with future potential employers. We were delighted to be supported by a host of local companies and organizations (see below for full details), who came to showcase exciting opportunities for further education or explain skills needed for the sector in which they work. Students were able to collect scholarship application forms for university and vocational institutions, and get their burning questions answered by industry professionals. Furthermore, students received an inspirational speech from several guest speakers about following your dreams, and a practical workshop on how to write powerful CVs and job applications. Here are some photos to highlight what a great day we had! A very big thank you to our guest companies and organizations who showcased their opportunities, including: ACLEDA Bank, Amansara Hotel, Amret, Anjali House, Build Bright University, CEFP, EGBOK Mission, Journeys within our Communities, NEA, Paul Dubrule L’Ecole d’Hôtellerie, PCT-SR, PEPY Tours, Piphop Samros Beauty School, Ponheary Ly Foundation, USEA, and YES Center.